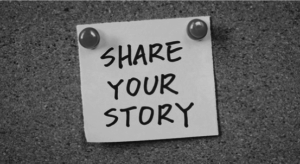 May has been “share a story” month in our youth centres, and we’ve helped young people reflect on where they’ve come from and where they might be heading. This is particularly pertinent as many are facing GCSE or A-Level exams, or thinking about their options and choices for September. their potential not their past,” reflecting the all too frequent situation where young people seem paralysed by their past – either from their own lack of ambition and hope, or because of the way in which society views them and their situations. You’ll read about the amazing journey of our newest trustee, Rosie Richter, elsewhere; but its important to recognise that her story is just one in thousands associated with The Door. As an organisation we approach our 27th birthday this summer, and I personally will be entering my 10th year of working here. Over this time I have met many, many young people who’s stories are intertwined with the support and impact from The Door. I have also met many more – some themselves now parents – who love to explain what The Door meant to them during their adolescence. Just recently I was at a networking meeting with a successful business owner who took great delight in recounting how, as a fourteen year old, he’d been involved in decorating The Door when we were based in Gloucester Street. He was keen to here the story of how The Door had progressed in the last 15 or 16 years, but equally wanted to share his own experiences and story. The truth is, everyone loves a good story. Sadly many of the stories we hear from families and young people are those which involve serious hardship, breakdown, trauma and challenge. But we know, these things need not be the end of those stories – with the love, dedication, vision and hope which every member of The Door team brings, the future, as they say, is yet unwritten.